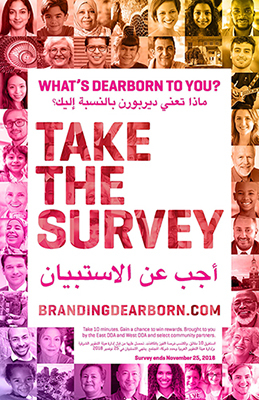 Paper copies of the survey will also be available at various Dearborn locations. This step is focused on gathering and understanding core insights from a variety of Downtown Dearborn internal and community stakeholders. The following document presents takeaways from a six-hour work session with a diverse group of some two-dozen Dearborn community stakeholders on February 1, 2019 and several follow up interviews with additional community groups. Using guidance from this round, we will revise this document and further expand on its content to prepare it for sharing with community stakeholders. On approval, this document will serve as the primary source of insight for developing the Dearborn brand. Download the Visioning Takeaways PDF file. In this step, we lay the groundwork for developing a responsive visual brand that will align with future brand narrative and messaging efforts. In this series of steps, we build the core brand storytelling tools (positioning, value propositions, the promise, the brand personality, etc.) for Downtown Dearborn, beginning with positioning scenarios and continuing with other elements as identified below. The brand story is an overview of Downtown Dearborn as expressed through the lens of its brand: It brings together all the brand elements — the positioning, promise, key value propositions and more — into a single unified narrative. It provides critical perspective to brand communications. The messaging is a foundational tool for verbal brand communications. Building on the brand promise and complementing the brand story, it breaks down the story into its component parts, provides an additional level of detail, and relates this detail to specific audiences (business owners, visitors, students, residents) to achieve specific communications goals.